When going from electrostatics to electrodynamics, one first needs to have a look at magnetostatics, to get familiar with (steady) electric currents. So let’s have a look at what they are. Of course, you already know what steady currents are. In that case, you should, perhaps, stop reading. But I’d recommend you go through it anyway. It’s always good to be explicit, so let’s be explicit. My impression is that it’s a simplification that doesn’t matter. So the answer to both question would be negative. But let’s examine them. First note that, in previous posts, we repeatedly said that, if we place a charge Q on any conductor, all charges will spread out in some way on the surface, so we have an equipotential on the surface and no electric field inside of the conductor. The physics behind are easy to understand: if there were an electric field inside of the conductor, and the surface were not an equipotential, the charges would keep moving until it became zero. Does it matter? Maybe. Maybe not. I discussed the electric field from a conductor in a previous post, so let me just recall some formulas here, first and foremost Gauss’ Law, which says that the electric flux from any closed surface S is equal to Qinside/ε0. Now, Qinside is, obviously, the sum of the charges inside the volume enclosed by the surface, and the most remarkable thing about Gauss’ Law is that the charge distribution inside of the volume doesn’t matter. So if we’re talking a uniformly charged sphere or a thin spherical shell of charge, it’s the same. The illustration below shows the field for a uniformly charged sphere: E is proportional to r (to be precise: E = (ρ·r)/(3ε0) for r ≤ R) inside the sphere, and outside E is proportional to 1/r2 (to be precise: E = Qinside/(4πε0r2) for r ≥ R). However, Gauss’ Law is a law that gives us the electric flux only, so we’re talking E only. We also have the magnetic field, i.e. the field vector B. So what’s the equivalent of Gauss’ Law for B? That’s Ampère’s Law, obviously, so let’s have a look at how Feynman derives that law. The illustration below explains the logic behind. The vector j is like the heat flow vector h which we used when explaining the basics of vector calculus: it is some amount passing expressed per unit time and per unit area. As for the use of n, that’s the same normal unit vector we used for h as well: we then wrote that h·n = |h|·|n|·cosθ = h·cosθ was the component of the heat flow that’s perpendicular or normal (as mathematicians prefer to say) to the surface. So here we’ve got the same: j·n·dS is the amount of charge flowing across an infinitesimally small area dS in a unit time. So to get the electric current I, which is the total charge passing per unit time through a surface S, we need to integrate the normal component of the flow through all the surface elements, which is what the integral above is doing. Note that I is not a vector but a scalar. We could, however, include the idea of the direction of flow by making I a vector, so then we write it in boldface: I. It is measured in coulomb per second, aka as ampere: 1 A = 1 C/s. Also note we don’t have any wires here: just surfaces and volumes. 🙂 Onwards! The equations of magnetostatics are Maxwell’s third and fourth equation and, as we used Maxwell’s first and second equation to derive Gauss’ Law, we’ll use these two to derive Ampère’s Law: (1) ∇•B = 0 and (2) c2∇×B = j/ε0. You know these equations: the first one basically says there’s no flux of B: there’s no such thing as magnetic charges, in other words. The second one says that a current produces some circulation of B. You also know these equations are valid only for static fields: all electric charge densities are constant, and all currents are steady, so the electric and magnetic fields are not changing with time: ∂E/∂t = 0 = ∂B/∂t. Forget about c2 for a moment (it’s just a constant) and note that ∇×B is referred to as the curl of B. This is the illustration which goes with it. 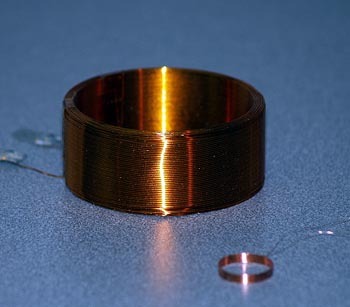 Coils of wire, and solenoids, pop up almost everywhere when studying electromagnetism. Indeed, transformers, inductances, electrical motors: it’s all coils. So, yes, we can’t escape them. 😦 So let’s get on with it. As you know, a solenoid is a long coil of wire wound in a tight spiral. The illustrations below show a cross-section and its magnetic field. Oh… What happens to the lines of B when they get to the end of the solenoid? Well… They just spread out in some way and return to enter the solenoid at the other end. Hmm… He’s really cutting corners here, isn’t he? But the formula is right, and I’d rather keep it short—just like he seems to want to do here. 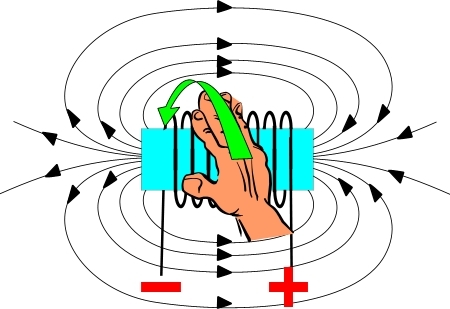 🙂 I’ll just insert an illustration showing another right-hand rule—the right-hand rule for solenoids: if the direction of the fingers of your right hand is the direction of current, then your thumb gives the direction of the magnetic field inside. You may wonder: does it matter where the + and − ends of the coil are? Good question because, in practice, we’ll have something that’s very tightly wound, like the coil below, so when making an actual coil (click on this link for a nice video), we’ll have several rows and so we wind from right to left and then back from left to right and so on and so on. So if we’d have two rows of wire, the two ends of the wire would come out on the same side, and that’s OK.
Of course, the wire needs to be insulated. What you see on the picture (and in the video) is the use of so-called magnet wire, which has a polymer film insulation. So when making the electrical connections at both ends, after winding the coil, you need to get rid of the insulation, but then it often melts just by the heat of soldering. And now that we’re talking practical stuff, let me say something about the magnetic core you see in the illustration above. A magnetic core is a material with high magnetic permeability as compared to the surrounding air, and this high permeability will cause the magnetic field to be concentrated in the core material. Now, there’s a phenomenon that’s called hysteresis, which means that the core material will tend to retain its magnetization when the applied field is removed. This is not very desirable in many applications, such as transformers or electric engines. That’s why so-called ‘soft’ magnetic materials with low hysteresis are often preferred. The so-called soft iron is such material: it’s literally softer because of a heat treatment increasing its ductility and reducing its hardness. Of course, for permanent magnets, a so-called ‘hard’ magnetic material will be used. But here we’re getting into engineering and that’s not what I want to write about in this blog. I’ll just end by noting that a magnetic field has a so-called north (N) and south (S) pole. That convention refers to the Earth’s north and south pole, of course. However, since opposite poles (north and south) attract, the North Magnetic Pole is actually the south pole of the Earth’s magnetic field, and the South is the north. 🙂 So it’s better not to think too much of the Earth’s poles when discussing the poles of a magnet. 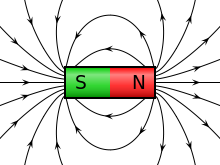 By convention, a magnet’s north pole is where the field lines of a magnet emerge, and the south pole is where they enter, as shown below. My previous posts focused mainly on photons, so this one should be focused more on matter-particles, things that have a mass and a charge. However, I will use it more as an opportunity to talk about fields and present some results from electrostatics using our new vector differential operators (see my posts on vector analysis). The speed of light is always the same, regardless of the reference frame (inertial or moving), and nothing can travel faster than light (except mathematical points, such as the phase velocity of a wavefunction). This universal rule is the basis of relativity theory and the mass-energy equivalence relation E = mc2. The constant speed of light also allows us to redefine the units of time and/or distance such that c = 1. For example, if we re-define the unit of distance as the distance traveled by light in one second, or the unit of time as the time light needs to travel one meter, then c = 1. Newton’s laws of motion define a force as the product of a mass and its acceleration: F = m·a. Hence, mass is a measure of inertia, and the unit of force is 1 newton (N) = 1 kg·m/s2. The momentum of an object is the product of its mass and its velocity: p = m·v. Hence, its unit is 1 kg·m/s = 1 N·s. Therefore, the concept of momentum combines force (N) as well as time (s). Energy is defined in terms of work: 1 Joule (J) is the work done when applying a force of one newton over a distance of one meter: 1 J = 1 N·m. Hence, the concept of energy combines force (N) and distance (m). Relativity theory establishes the relativistic energy-momentum relation pc = Ev/c, which can also be written as E2 = p2c2 + m02c4, with m0 the rest mass of an object (i.e. its mass when the object would be at rest, relative to the observer, of course). These equations reduce to m = E and E2 = p2 + m02 when choosing time and/or distance units such that c = 1. The mass m is the total mass of the object, including its inertial mass as well as the equivalent mass of its kinetic energy. The relationships above establish (a) energy and time and (b) momentum and position as complementary variables and, hence, the Uncertainty Principle can be expressed in terms of both. The Uncertainty Principle, as well as the Planck-Einstein relation and the de Broglie relation (not shown on the diagram), establish a quantum of action, h, whose dimension combines force, distance and time (h ≈ 6.626×10−34 N·m·s). This quantum of action (Wirkung) can be defined in various ways, as it pops up in more than one fundamental relation, but one of the more obvious approaches is to define h as the proportionality constant between the energy of a photon (i.e. 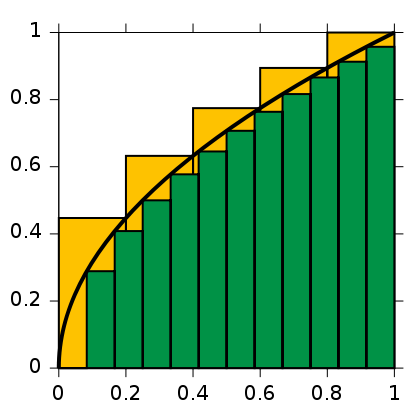 the ‘light particle’) and its frequency: h = E/ν. Note that we talked about forces and energy above, but we didn’t say anything about the origin of these forces. That’s what we are going to do now, even if we’ll limit ourselves to the electromagnetic force only. Electrostatics: (i) ∇•E = ρ/ε0 and (ii) ∇×E = 0. Magnetostatics: (iii) c2∇×B = j/ε0 and (iv) ∇•B = 0. Electrostatics: The ρ in equation (i) is the so-called charge density, which describes the distribution of electric charges in space: ρ = ρ(x, y, z). To put it simply: ρ is the ‘amount of charge’ (which we’ll denote by Δq) per unit volume at a given point. As for ε0, that’s a constant which ensures all units are ‘compatible’. Equation (i) basically says we have some flux of E, the exact amount of which is determined by the charge density ρ or, more in general, by the charge distribution in space. As for equation (ii), i.e. ∇×E = 0, we can sort of forget about that. It means the curl of E is zero: everywhere, and always. So there’s no circulation of E. Hence, E is a so-called curl-free field, in this case at least, i.e. when only stationary charges and steady currents are involved. Magnetostatics: The j in (iii) represents a steady current indeed, causing some circulation of B. The c2 factor is related to the fact that magnetism is actually only a relativistic effect of electricity, but I can’t dwell on that here. I’ll just refer you to what Feynman writes about this in his Lectures, and warmly recommend to read it. Oh… Equation (iv), ∇•B = 0, means that the divergence of B is zero: everywhere, and always. So there’s no flux of B. None. So B is a divergence-free field. Because of the neat separation, we’ll just forget about B and talk about E only. Now, the electromagnetic force works pretty much like gravity, except that, when discussing gravity, we only have positive ‘charges’ (the mass of some object is always positive). 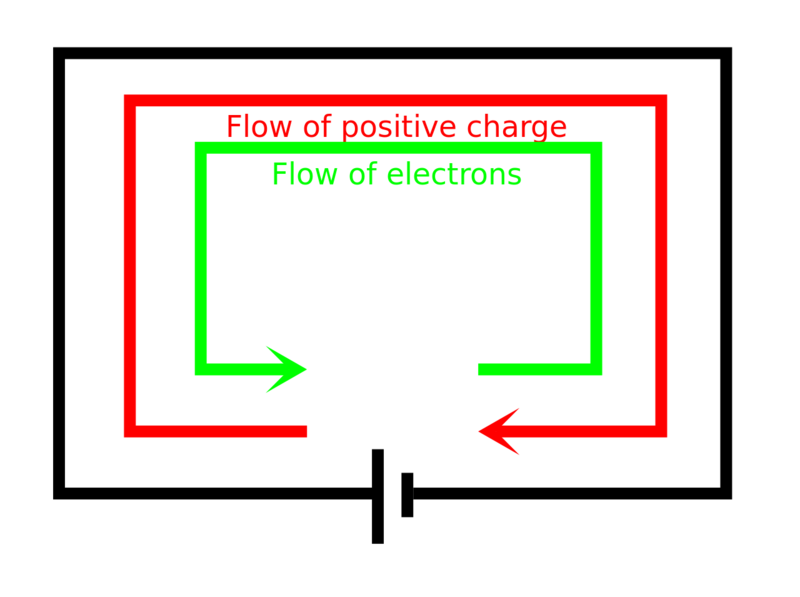 In electromagnetics, we have positive as well as negative charge, and please note that two like charges repel (that’s not the case with gravity). Hence, doing work against the electromagnetic force may involve bringing like charges together or, alternatively, separating opposite charges. We can’t say. Fortunately, when it comes to the math of it, it doesn’t matter: we will have the same minus sign in front of our integral. The point is: we’re doing work against the force, and so that’s what the minus sign stands for. So it has nothing to do with the specifics of the law of attraction and repulsion in this case (electromagnetism as opposed to gravity) and/or the fact that electrons carry negative charge. No. Let’s get back to the integral. Just in case you forgot, the integral sign ∫ stands for an S: the S of summa, i.e. sum in Latin, and we’re using these integrals because we’re adding an infinite number of infinitesimally small contributions to the total effort here indeed. You should recognize it, because it’s a general formula for energy or work. It is, once again, a so-called line integral, so it’s a bit different than the ∫f(x)dx stuff you learned from high school. Not very different, but different nevertheless. What’s different is that we have a vector dot product F•ds after the integral sign here, so that’s not like f(x)dx. In case you forgot, that f(x)dx product represents the surface of an infinitesimally rectangle, as shown below: we make the base of the rectangle smaller and smaller, so dx becomes an infinitesimal indeed. And then we add them all up and get the area under the curve. If f(x) is negative, then the contributions will be negative. But so we don’t have little rectangles here. We have two vectors, F and ds, and their vector dot product, F•ds, which will give you… Well… I am tempted to write: the tangential component of the force along the path, but that’s not quite correct: if ds was a unit vector, it would be true—because then it’s just like that h•n product I introduced in our first vector calculus class. However, ds is not a unit vector: it’s an infinitesimal vector, and, hence, if we write the tangential component of the force along the path as Ft, then F•ds = |F||ds|cosθ = F·cosθ·ds = Ft·ds. So this F•ds is a tangential component over an infinitesimally small segment of the curve. In short, it’s an infinitesimally small contribution to the total amount of work done indeed. You can make sense of this by looking at the geometrical representation of the situation below. I am just saying this so you know what that integral stands for. Note that we’re not adding arrows once again, like we did when calculating amplitudes or so. It’s all much more straightforward really: a vector dot product is a scalar, so it’s just some real number—just like any component of a vector (tangential, normal, in the direction of one of the coordinates axes, or in whatever direction) is not a vector but a real number. Hence, W is also just some real number. It can be positive or negative because… Well… When we’d be going down the stairs with our bucket of water, our minus sign doesn’t disappear. Indeed, our convention to put that minus sign there should obviously not depend on what point a and b we’re talking about, so we may actually be going along the direction of the force when going from a to b. As a matter of fact, you should note that’s actually the situation which is depicted above. So then we get a negative number for W. Does that make sense? Of course it does: we’re obviously not doing any work here as we’re moving along the direction, so we’re surely not adding any (potential) energy to the system. On the contrary, we’re taking energy out of the system. Hence, we are reducing its (potential) energy and, hence, we should have a negative value for W indeed. So, just think of the minus sign being there to ensure we add potential energy to the system when going against the force, and reducing it when going with the force. OK. You get this. You probably also know we’ll re-define W as a difference in potential between two points, which we’ll write as Φ(b) – Φ(a). Now that should remind you of your high school integral ∫f(x)dx once again. For a definite integral over a line segment [a, b], you’d have to find the antiderivative of f(x), which you’d write as F(x), and then you’d take the difference F(b) – F(a) too. Now, you may or may not remember that this antiderivative was actually a family of functions F(x) + k, and k could be any constant – 5/9, 6π, 3.6×10124, 0.86, whatever! – because such constant vanishes when taking the derivative. Why so short? Well… We all just love these mysterious abbreviations, don’t we? 🙂 Jokes aside, it’s true some of those vector equations pack an awful lot of information. Just take Feynman’s advice here: “If it helps to write out the components to be sure you understand what’s going on, just do it. There is nothing inelegant about that. In fact, there is often a certain cleverness in doing just that.” So… Let’s move on. The Γ here is the curve between point 1 and 2, so that’s the path along which we’re going, and ∇ψ must represent some vector field. Let’s go back to our W integral. I should mention that it doesn’t matter what path we take: we’ll always get the same value for W, regardless of what path we take. That’s why the illustration above showed two possible paths: it doesn’t matter which one we take. Again, that’s only because E is a vector field. To be precise, the electrostatic field is a so-called conservative vector field, which means that we can’t get energy out of the field by first carrying some charge along one path, and then carrying it back along another. You’ll probably find that’s obvious, and it is. Just note it somewhere in the back of your mind. So we’re done. We should just substitute E for ∇Φ, shouldn’t we? Well… Yes. For minus ∇Φ, that is. Another minus sign. Why? Well… It makes that W(unit) integral come out alright. Indeed, we want a formula like W = Φ(b) – Φ(a), not like Φ(a) – Φ(b). Look at it. We could, indeed, define E as the (positive) gradient of some scalar field ψ = –Φ, and so we could write E = ∇ψ, but then we’d find that W = –[ψ(b) – ψ(a)] = ψ(a) – ψ(b). You’ll say: so what? Well… Nothing much. It’s just that our field vectors would point from lower to higher values of ψ, so they would be flowing uphill, so to say. Now, we don’t want that in physics. Why? It just doesn’t look good. We want our field vectors to be directed from higher potential to lower potential, always. Just think of it: heat (h) flows from higher temperature (T) to lower, and Newton’s apple falls from greater to lower height. Likewise, when putting a unit charge in the field, we want to see it move from higher to lower electric potential. Now, we can’t change the direction of E, because that’s the direction of the force and Nature doesn’t care about our conventions and so we can’t choose the direction of the force. But we can choose our convention. So that’s why we put a minus sign in front of ∇Φ when writing E = –∇Φ. It makes everything come out alright. 🙂 That’s why we also have a minus sign in the differential heat flow equation: h = –κ∇T. But… Yes? In reality, it’s electrons going through a wire, isn’t? Not protons. Yes. But it doesn’t matter. Units are units in physics, and they’re always +1, for whatever (time, distance, charge, mass, spin, etcetera). Always. For whatever. Also note that in laboratory experiments, or particle accelerators, we often use protons instead of electrons, so there’s nothing weird about it. Finally, and most fundamentally, if we have a –e charge moving through a neutral wire in one direction, then that’s exactly the same as a +e charge moving in the other way. Just to make sure you get the point, let’s look at that illustration once again. We already said that we have F and, hence, E pointing from a to b and we’ll be reducing the potential energy of the system when moving our unit charge from a to b, so W was some negative value. Now, taking into account we want field lines to point from higher to lower potential, Φ(a) should be larger than Φ(b), and so… Well.. Yes. It all makes sense: we have a negative difference Φ(b) – Φ(a) = W(unit), which amounts, of course, to the reduction in potential energy. So now we can calculate all potentials, i.e. when we know where the charges are at least. I’ve shown an example below. As you can see, besides having zero potential at infinity, we will usually also have one or more equipotential surfaces with zero potential. One could say these zero potential lines sort of ‘separate’ the positive and negative space. That’s not a very scientifically accurate description but you know what I mean. Let me make a few final notes about the units. First, let me, once again, note that our unit charge is plus one, and it will flow from positive to negative potential indeed, as shown below, even if we know that, in an actual electric circuit, and so now I am talking about a copper wire or something similar, that means the (free) electrons will move in the other direction. If you’re smart (and you are), you’ll say: what about the right-hand rule for the magnetic force? Well… We’re not discussing the magnetic force here but, because you insist, rest assured it comes out alright. 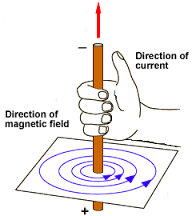 Look at the illustration below of the magnetic force on a wire with a current, which is a pretty standard one. So we have a given B, because of the bar magnet, and then v, the velocity vector for the… Electrons? No. You need to be consistent. It’s the velocity vector for the unit charges, which are positive (+e). 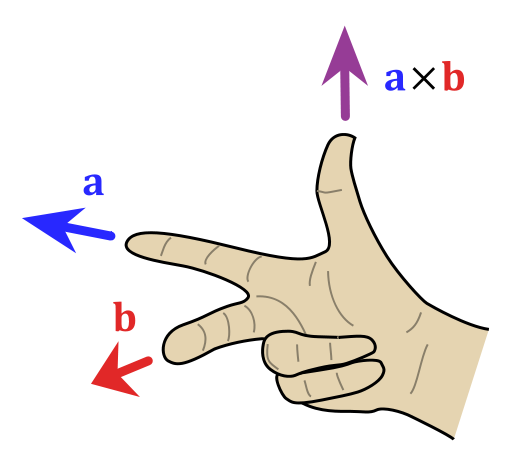 Now just calculate the force F = qv×B = ev×B using the right-hand rule for the vector cross product, as illustrated below. So v is the thumb and B is the index finger in this case. All you need to do is tilt your hand, and it comes out alright. But… We know it’s electrons going the other way. Well… If you insist. But then you have to put a minus sign in front of the q, because we’re talking minus e (–e). So now v is in the other direction and so v×B is in the other direction indeed, but our force F = qv×B = –ev×B is not. Fortunately not, because physical reality should not depend on our conventions. 🙂 So… What’s the conclusion. Nothing. You may or may not want to remember that, when we say that our current j current flows in this or that direction, we actually might be talking electrons (with charge minus one) flowing in the opposite direction, but then it doesn’t matter. In addition, as mentioned above, in laboratory experiments or accelerators, we may actually be talking protons instead of electrons, so don’t assume electromagnetism is the business of electrons only. To conclude this disproportionately long introduction (we’re finally ready to talk more difficult stuff), I should just make a note on the units. Electric potential is measured in volts, as you know. However, it’s obvious from all that I wrote above that it’s the difference in potential that matters really. From the definition above, it should be measured in the same unit as our unit for energy, or for work, so that’s the joule. To be precise, it should be measured in joule per unit charge. But here we have one of the very few inconsistencies in physics when it comes to units. The proton is said to be the unit charge (e), but its actual value is measured in coulomb (C). To be precise: +1 e = 1.602176565(35)×10−19 C. So we do not measure voltage – sorry, potential difference 🙂 – in joule but in joule per coulomb (J/C). Now, we usually use another term for the joule/coulomb unit. You guessed it (because I said it): it’s the volt (V). One volt is one joule/coulomb: 1 V = 1 J/C. That’s not fair, you’ll say. You’re right, but so the proton charge e is not a so-called SI unit. Is the Coulomb an SI unit? Yes. It’s derived from the ampere (A) which, believe it or not, is actually an SI base unit. One ampere is 6.241×1018 electrons (i.e. one coulomb) per second. You may wonder how the ampere (or the coulomb) can be a base unit. Can they be expressed in terms of kilogram, meter and second, like all other base units. The answer is yes but, as you can imagine, it’s a bit of a complex description and so I’ll refer you to the Web for that. This is a so-called Poisson equation. The ∇2 operator is referred to as the Laplacian and is sometimes also written as Δ, but I don’t like that because it’s also the symbol for the total differential, and that’s definitely not the same thing. The formula for the Laplacian is given below. 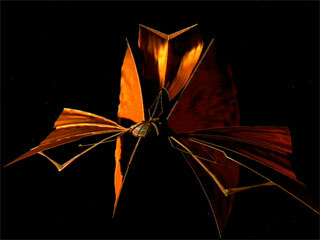 Note that it acts on a scalar field (i.e. the potential function Φ in this case). As Feynman notes: “The entire subject of electrostatics is merely the study of the solutions of this one equation.” However, I should note that this doesn’t prevent Feynman from devoting at least a dozen of his Lectures on it, and they’re not the easiest ones to read. [In case you’d doubt this statement, just have a look at his lecture on electric dipoles, for example.] In short: don’t think the ‘study of this one equation’ is easy. All I’ll do is just note some of the most fundamental results of this ‘study’. Also note that ∇•E is one of our ‘new’ vector differential operators indeed: it’s the vector dot product of our del operator (∇) with E. That’s something very different than, let’s say, ∇Φ. A little dot and some bold-face type make an enormous difference here. 🙂 You may or may remember that we referred to the ∇• operator as the divergence (div) operator (see my post on that). Gauss’ Law is not to be confused with Gauss’ Theorem, about which I wrote elsewhere. It gives the flux of E through a closed surface S, any closed surface S really, as the sum of all charges inside the surface divided by the electric constant ε0 (but then you know that constant is just there to make the units come out alright). The derivation of Gauss’ Law is a bit lengthy, which is why I won’t reproduce it here, but you should note its derivation is based, mainly, on the fact that (a) surface areas are proportional to r2 (so if we double the distance from the source, the surface area will quadruple), and (b) the magnitude of E is given by an inverse-square law, so it decreases as 1/r2. That explains why, if the surface S describes a sphere, the number we get from Gauss’ Law is independent of the radius of the sphere. The diagram below (credit goes to Wikipedia) illustrates the idea. The diagram can be used to show how a field and its flux can be represented. Indeed, the lines represent the flux of E emanating from a charge. Now, the total number of flux lines depends on the charge but is constant with increasing distance because the force is radial and spherically symmetric. A greater density of flux lines (lines per unit area) means a stronger field, with the density of flux lines (i.e. 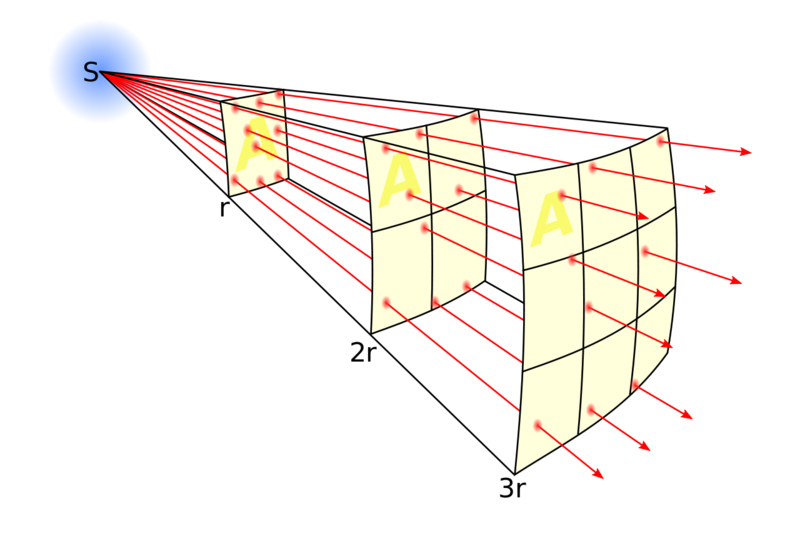 the magnitude of E) following an inverse-square law indeed, because the surface area of a sphere increases with the square of the radius. Hence, in Gauss’ Law, the two effect cancel out: the two factors vary with distance, but their product is a constant. Now, Gauss’ Law also applies to an infinitesimal cubical surface and, in one of my posts on vector calculus, I showed that the flux of E out of such cube is given by ∇•E·dV. At this point, it’s probably a good idea to remind you of what this ‘new’ vector differential operator ∇•, i.e. our ‘divergence’ operator, stands for: the divergence of E (i.e. ∇• applied to E, so that’s ∇•E) represents the volume density of the flux of E out of an infinitesimal volume around a given point. Hence, it’s the flux per unit volume, as opposed to the flux out of the infinitesimal cube itself, which is the product of ∇•E and dV, i.e. ∇•E·dV. The force is inversely proportional to the square of the distance and so we have an inverse-square law here indeed. The force is proportional to the charge(s). Finally, we have a proportionality constant, 1/4πε0, which makes the units come out alright. You may wonder why it’s written the way it’s written, i.e. with that 4π factor, but that factor (4π or 2π) actually disappears in a number of calculations, so then we will be left with just a 1/ε0 or a 1/2ε0 factor. So don’t worry about it. What a relief, isn’t it? The simplest formula ever: the (magnitude) of the field as a simple function of the charge q and its distance (r) from the point that we’re looking at, which we’ll write as P = (x, y, z). But what origin are we using to measure x, y and z. Don’t be surprised: the origin is q. You should just do the integral to check this result. It’s the same integral but with P0 (infinity) as point a and P as point b in the integral, so we have ∞ as start value and r as end value. The integral then yields Φ(P) – Φ(P0) = –q/4πε0[1/r – 1/∞). [The k constant falls away when subtracting Φ(P0) from Φ(P).] But 1/∞ = 0, and we had a minus sign in front of the integral, which cancels the sign of –q/4πε0. So, yes, we get the wonderfully simple result above. Also please do quickly check if it makes sense in terms of sign: the unit charge is +e, so that’s a positive charge. Hence, Φ(x, y, z) will be positive if the sign of q is also positive, but negative if q would happen to be negative. So that’s OK.
Isn’t this wonderful? We have an expression for the energy of a field, not in terms of the charges or the charge distribution, but in terms of the field they produce. First, you should note that you know this E•E expression already: E•E is just the square of the magnitude of the field vector E, so E•E = E2. That makes sense because we know, from what we know about waves, that the energy is always proportional to the square of an amplitude, and so we’re just writing the same here but with a little proportionality constant (ε0). Just to make sure you ‘get’ what we’re talking about here: u is the energy density in the little cube dV in the rather simplistic (and, therefore, extremely useful) illustration below (which, just like most of what I write above, I got from Feynman). Now that should make sense to you—I hope. 🙂 In any case, if you’re still with me, and if you’re not all formula-ed out you may wonder how we get that ε0E•E = ε0E2 expression from that ρΦ expression. Of course, you know that E = –∇Φ, and we also have the Poisson equation ∇2Φ = –ρ/ε0, but that doesn’t get you very far. It’s one of those examples where an easy-looking formula requires a lot of gymnastics. However, as the objective of this post is to do some of that, let me take you through the derivation. So what? Where are we going with this? Relax. Be patient. What volume and surface are we talking about here? To make sure we have all charges and influences, we should integrate over all space and, hence, the surface goes to infinity. So we’re talking a (spherical) surface of enormous radius R whose center is the origin of our coordinate system. I know that sounds ridiculous but, from a math point of view, it is just the same like bringing a charge in from infinity, which is what we did to calculate the potential. So if we don’t difficulty with infinite line integrals, we should not have difficulty with infinite surface and infinite volumes. That’s all I can, so… Well… Let’s do it. What I wanted to do is to give you some feel for those vector and field equations in the electrostatic case. We now need to bring magnetic field back into the picture and, most importantly, move to electrodynamics, in which the electric and magnetic field do not appear as completely separate things. No! In electrodynamics, they are fully interconnected through the time derivatives ∂E/∂t and ∂B/∂t. That shows they’re part and parcel of the same thing really: electromagnetism. But we’ll try to tackle that in future posts. Goodbye for now!